Cas Lowood has always worked alone on his quest to dispatch murderous ghosts and discover the demon who killed his father. Imagine his annoyance when he moves to Thunder Bay to kill the intensely horrific ghost Anna Dressed in Blood and he accidentally picks up a couple of teenaged tag-a-longs. When he attempts to dispatch Anna, he discovers that she’s unlike any ghost he’s ever fought before. She’s frightening and mesmerizing in her power. Cas digs deeper into Anna’s story and begins, for once, to see a ghost as an unwilling victim rather than simply a supernatural murderess. Initially, I picked up this book because of the fantastic cover art (Yup! I’m one of those people). 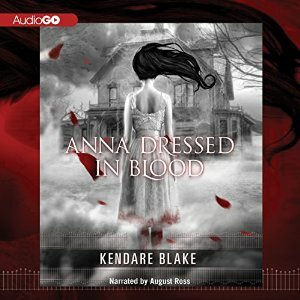 Turns out Anna Dressed in Blood was a really good choice if you’re a fan of teen horror. I hadn’t read a good ghost story in a long time, and this one was quite refreshing. The characters were easy to like, and the mystery kept the book interesting. This book was fun and quick. Unfortunately, I listened to the audiobook rather than reading the book. I don’t recommend this course. Ross annoyed me with his too-clear annunciations, his pauses, and his slow reading. It ruined the rhythm of the narrative, and made the dialog fall flat. There were several times I wanted to give up on the book just because the narration was annoying me. But I couldn’t do it because I was enjoying the story too much. This post is for R. I. P. X @TheEstellaSociety and the 2015 Halloween Reading Challenge @ReadingEverySeason. It is also for #Diversiverse, @BookLust, which is all about reading books by people of a variety of ethnic/racial backgrounds, so I will provide tell you a little about the author, Kendare Blake. 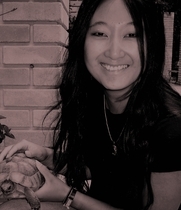 Kendare Blake was born in Seoul, Korea and was adopted by her American parents when she was very young. She writes dark fantasy including, but not limited to: The Girl of Nightmares series and The Goddess War series (beginning with Antigoddess). After enjoying The Girl of Nightmares series so much, I’ll probably be picking up Antigoddess sometime soon. I read this book a couple years ago. I LOVED it. I need to get the second book in the series. Yeah, you really should. It's pretty good. I'm hoping there will be a third soon!